So you already think you want to become a kitesurfer? Awesome decision as you’ll love the thrill and freedom you get with taking up the sport! Welcome to the club; there’s many amazing times ahead for you.. Your school or instructor should hold 3rd party insurance incase you accidently hit anyone with a kite/board when learning. This is a very unlikely scenario but always worth checking. Your instructor or one of the school members should be a qualified first aider incase of any accident. 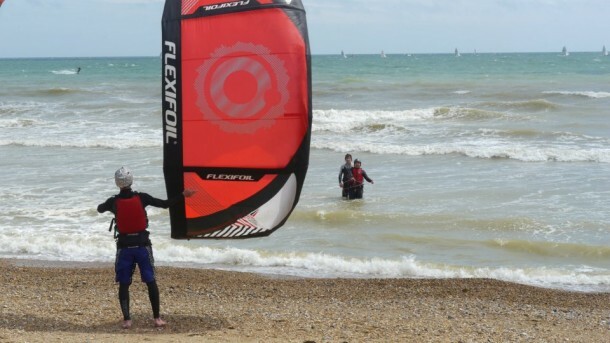 Learning to kitesurf will generally start with learning the basics of the kiting equipment and getting the feel for flying different sized kites while still on land. Once you’re comfortable with the basics of controlling a kite, your instructor will likely take you in the water to ‘body drag’, piloting the kite to move you through the water without yet worrying about using a board. Often kite schools will run short beginner courses aiming to teach you up to the point where you are able to manage and use the board to accomplish your 1st water starts. It can vary how long it takes to ‘get up and riding’ and will depend very much on the school, the conditions and the individual, but generally 10 – 15 hours of lessons aim to get you to ‘board start’ level. 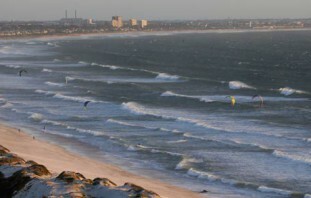 Kitesurfing is listed as a water sport, however it is best described as an air-sport. The majority of skills needed to learn are all to do with the kite and how you control it. It’s not always best to rush to get on the board, so don’t be put off by the fact that the majority of the time you spend in the water during lessons will be without the board. When learning a new sport everything needs to become second nature before you can progress, the more comfortable you are with the kite the easier you will find the board start. To allow you to progress faster try to remain calm in the water with the kite and really focus on getting the best kite control you can. Many kiting hotspots around the world have clubs aiming to join kiters together, promote safety, organise activities, competitions and engage with the local environment. 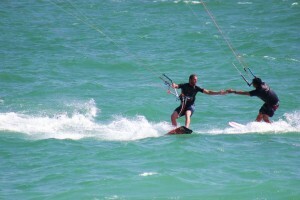 It’s a great way to meet people and learn form the more experienced kiters. It’s also an easy way for others to identify that you are a beginner in case you might ever need help. We all require help launching and landing but knowing other club members are in the vicinity will help to build your confidence, especially in the event that any other issues arise. Get Yourself a Great KB (Kite Buddy)! You may not realise it initially but having a kite buddy to share your beginner experiences and encourage you (not to mention to kite with) is the 1st step to joining a great community of kiters. You’ll need someone to look out for you, especially when starting out. You might find it a good idea to set the kite up together, take turns with the kite while your buddy launches and lands you (and can retrieve the kite if you run into difficulty), hand you the board and generally be there while you are still unsure of yourself. My instructor practically forced me to swap phone numbers with another beginner who I’d barely spoken to. I’m so glad they did as I had no idea at the time how much I needed a KB (happily now one of my best mates) ! Whether it be Facebook groups or online forums, there’s a huge amount of online interaction you can join in with, helping you to learn and giving you the opportunity to ask questions. 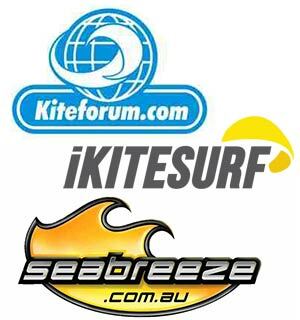 Most forums have a section aimed at newbies so there’s no need to feel stupid as more experienced kiters are there to help with beginner questions. 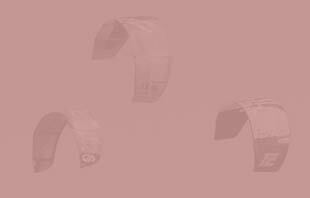 Don’t just reply on others, learn to read the wind yourself and get to know the wind speeds you prefer to kite in, for the kite sizes you use. Not all kite spots have reliable or the same type of winds and it’s great to know when you need to be ready to go go GO! Make a habit of checking Wind GURU, Windfinder, WeatherFlow or other localised wind prediction sites/apps; kite addicts will often check multiple times a day! Ok I know we’re biased but there’s a reason why we’re the worlds leading brand producing a series of instructional kitesurfing videos on and offline. The Progression series of instructional videos gives you easy access to video content that will give you the confidence and motivation to improve quickly and safely. Kitesurfers find that through Progression they are supported in their learning as the videos build on everything you may have already, or are about to learn. 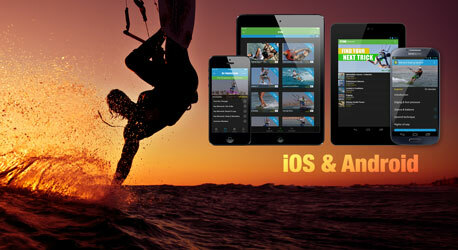 Check out our Progression Player App for easy to access kite tips on the go. Once you’ve tried the basics at your local spot you may find yourself getting a little frustrated with your progress. This might be due to unfavourable local conditions for beginners, lack of confidence, or even just having the time. Going away on a kitesurfing holiday will really kickstart your progress (see our other blog post about kiting holidays) as you’ll have the time and dedication in ideal conditions to perfect your technique. You’ll find a huge amount of ‘kite trips’, ‘kite camps’ and holidays available all around the world and hopefully you’ll have a great time and return home a better kiter! It’s fun to be inspired watching the pros but it’ll also improve your technique seeing how it’s really done. Follow up what you have observed by cross referencing it to the Progression instructional videos to break the moves down bit by bit or gain more inspiration from our 200+ free YouTube videos. 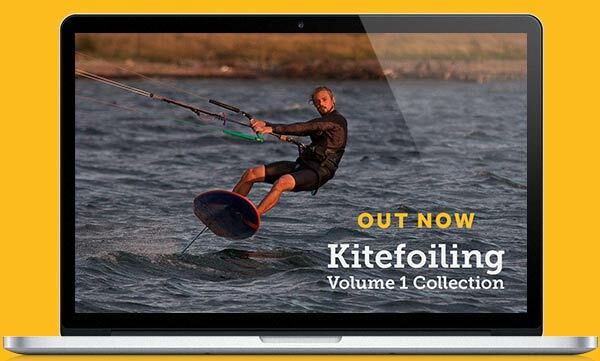 Start following your favourite pro kiters on Facebook, Twitter, through video etc and it’ll help you shape your kiting style and motivate you to be the type of kiter you aspire to be. Once you have a little experience under your belt it’s great to take time to also watch other beginners as you can learn from their mistakes too. Wherever you start your kitesurfing journey I hope that it’ll be one of the best things you ever learn and enjoy. Once you’ve taken the plunge, make sure you check out our specific Beginner Zone packed full of even more helpful information! We’ll be really interested to hear back from you on how it all goes so do keep us posted via Facebook, Twitter or send us an email. Good luck!